Vogue, GQ and Vanity Fair, we’ve all flipped through magazines and thought, “I want that look.” Who says it can only be found in Paris or New York? Emily has been involved in the retail and fashion industries for over 20 years. Based in Houston, Emily works with clients as a personal stylist helping them find the right look for their lifestyles. Emily gained her experience with a degree from Texas Tech University in Fashion Merchandising and has also worked for various major retailers and upscale boutiques. Emily will come to your home, give your closet a “make-over”, identify what works, what doesn’t and what you need to pull it all together. Whether the need is a complete new wardrobe or shopping for a few select pieces, when she is finished, you will look great and feel confident. Emily has a relaxed and friendly approach that will put you at ease, no matter what your body type, age or budget. Do you have a special event on the horizon and need help planning attire? Are you bored with your wardrobe and ready to mix things up? Emily has a keen eye for detail and creative approach to pairing new outfit options for you utilizing items that currently exist in your closet. Along with developing new outfits, recommendations will be made to enhance and refresh your current attire. Photo books detailing the various outfits we build from your wardrobe can be created for an additional fee. Please inquire if this peeks your interest. The goal as your personal shopper is to help you feel prepared and confidently dressed for any occasion. Emily strives to maximize your wardrobe while keeping your look current. With or without you, Emily will source unique items with the goal to fulfill the recommendation list she has tailored for you. 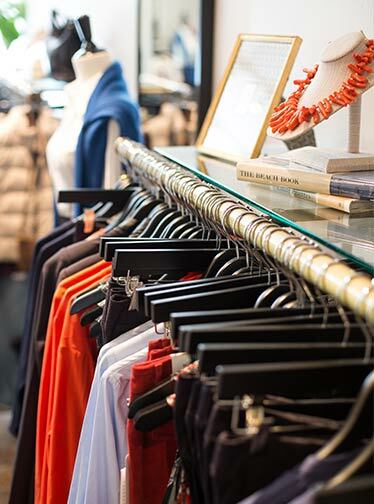 Working with efficiency, dressing rooms are prepared in advance and stores are chosen based on your personal style analysis, the occasion and your budget. If personal shopping without client, clothes are selected and delivered to your home or office. Is your closet full of clothes that you love and some you don’t know what to do with? Are you bored with your everyday outfits and feel you don’t have anything to wear? A closet consultation helps to distinguish your personal style and show you how to use it. We start by editing and then take inventory. Through this process and an assessment of your everyday lifestyle, we begin to refine and refresh your wardrobe helping to identify clothing that does not fit properly, needs to be cleaned or should be altered to fit correctly. Lastly, we show you how to select clothes that flatter and help you to create new outfits using the clothes you already have. Together through a series of personal questions, we identify and discuss your body-type, while teaching you how to dress it. We consider all the moving parts of your life, and what wardrobe elements compliment it best. Your personal color palette is explored along with places you frequent for shopping, while considering age appropriate dress and budget. Tips and suggestions are provided so that you feel empowered when you step out of your closet. In a group setting Emily is available to speak on a variety of wardrobe, shopping and styling topics. Seminars can easily be tailored to fit groups needs. Upon request and occasion, fashion shows can be scheduled and pulled together to exhibit examples of a given discussion or season. Using select clothing and/or models Emily can demonstrate current looks, seasonal pieces and dress code appropriate wear. Prior to working with Emily, choosing smart casual outfits and keeping up with outfits for evening work events was simply overwhelming. Now, I hand my worries over to Emily! She magically selects outfits that I love and gather many compliments from family and friends. Now, I can focus on enjoying myself at the events! I have enjoyed her services so much that she has also assisted both of my daughters and husband. You won’t find a stylist who is more respectful, kind, honest and helpful! Emily was a class act! Organized, talented and professional. Her style suited all the various volunteers that were modeling for our event. She listened to them, evaluated what we needed for the show and made everyone happy. The night of the event she worked well with the event team and models to ensure that the show was a success, and it was. Emily executes everything with a polished, positive attitude. We value her dedication to the women of Dress for Success Houston. Emily came over, helped me organize my closet, find a coordinated up-to-date style, make smart purchases, and 3 years later I am still loving everything she did. As a design professional, I am with clients every day and looking my best is part of my business. When I was four months pregnant, I had a lot of anxiety about finding clothes that didn’t look like “maternity”. Emily selected the core pieces that I wore throughout my pregnancy and saved me loads of time and anxiety. She knew where to go, which pieces I would need most, and how to anticipate fit as I began to show more. Working with Emily turned a dreaded activity into something that I enjoyed. I began working with Emily over 5 years ago. She immediately put me at ease and turned my life long dislike of shopping into a fun experience. Emily began by editing my wardrobe. She culled what didn’t work and determined what was lacking. She is always mindful of my existing wardrobe and budget. Emily has shown me how to interchange all my garments to make the most of every piece. She made a photo album of different combinations of clothing that I have found invaluable. Emily has saved me thousands of dollars in fashion mistakes and many miserable hours of clueless shopping. I now have a well rounded wardrobe that makes me feel confident and ready for any event. I only wish I had met Emily sooner. Emily was a terrific help when it came time for me to restock my casual wardrobe. With her excellent sense of style and ability to see things that a typical guy – like me – doesn’t, I walked away with several great looks that get me. Emily is amazing! The closet clean out and personal shopping with Emily was fun and effective. I wear everything we purchased. Some items have become standbys for my around the world travels. Emily you are worth your weight in gold. Emily is really wonderful to work with. She is incredibly creative and knowledgeable while being very respectful of my individual goals, style, and budget. I really like the way she doesn’t push, but gently leads me to great choices. She has a great eye and can quickly access what works and what doesn’t; I really look forward to the time I spend with Emily. My closet was doing double duty as long term storage for all those suits and shirts and things that I never really wore any more. Emily helped me go through everything. I had old favorites tailored to fit again, and also delivered five bags to Goodwill. Plus, I have a framework to help me avoid getting into that state again. Don’t clean out your garage. Hire Emily, clean your closet. You’ll be glad you did. She’s terrific. Looking for gift ideas? Together we can customize the perfect gift to fit your needs.